GB Racing’s revolutionary new tough, high-impact composite material made from 60% Long Glass Fiber Nylon provides ultimate in protection for your machine! The tough long glass fiber nylon is a high impact and abrasion resistant material that is designed to absorb energy without cracking in most situations for repeatable uses. Designed with aesthetics in mind and to be installed over your existing OEM engine cover. This is a bolt on product, allowing fast and easy removal and/or replacement without having to remove the original cover. GB Racing covers are FIM approved and proven at the highest levels worldwide, including MotoGP, British Superbikes, World Superbikes and MotoAmerica. All GB Racing products are designed and manufactured in the UK -- including mold making in house at GB’s Hertfordshire UK facility. Benefits to this in-house design and production include the ability to quickly adapt and improve the product designs on a regular basis. One of the patented designs is the internal reverse wear feature that helps indicate when a cover may need replacement. For safety reasons beware of counterfeit covers which may include the GB Racing logo and or other minor detail changes. Often the counterfeit covers are based on earlier GB model designs and have been shown to use an inferior nonimpact or abrasion resistant material. For those that are familiar with the GB products, be aware of the solid feel versus the lighter cheaper knockoff materials. GB Racing products are further differentiated from knockoffs by way of unique branded packaging. Knockoff covers will often not pass tech inspections and can be dangerous to other competitors in the case of a fall. GB Racing products are the clear benchmark in high-performance, bolt-on motorcycle protection for the short circuit, road racing and street bike community. GB Racing is the only company to have received FIM product approval from 2009 through to 2020 on its range of bolt-on non metallic secondary engine covers, along with MCRCB, FFM, IDM, AMA/MotoAmerica, CIV, IDM, FFM and World Endurance approval. WGP products also have two patents granted: Improved Composition (Patent #GB2479405) for the material used in our engine protection and a patent for Reverse Wear Indicators (Patent #GB2532535). Each product is specifically designed, engineered and manufactured to deliver the best overall quality protection. Our core product range is our FIM-approved bolt-on secondary engine covers. We vary the injection-moulded material thickness, from 2mm to 12mm to give maximum engine protection without compromising ground clearance or weight. What is the difference between STOCK and KIT engine covers? The STOCK refers to the stock casings, as you would see on your bike in the showroom. The KIT refers to factory (HRC/YEC ) casings, normally the alternator cover, where race teams would purchase factory alternators that produce minimal charging of the battery, to reduce inertia and therefore increase performance. 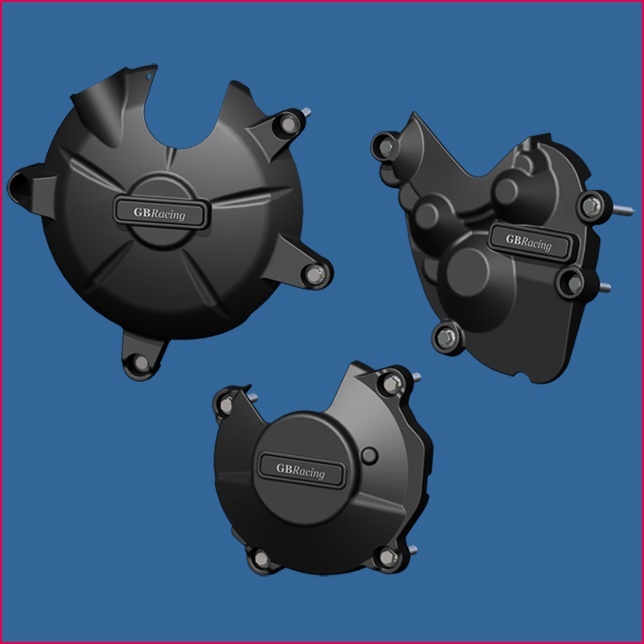 Therefore, the KIT alternator cover is designed for a kit alternator casing which has replaced the standard casing. The GB Racing alternator/crank covers are designed to provide the best protection to your motorcycle's alternator. Designs that fit either the standard stock casings or the factory race kit alternator covers. The alternator is located on the left hand side of your motorcycle. All covers come supplied with replacement bolts. There is no need to remove stock casings or gasket seals. The GB Racing clutch cover will provide protection and style to your motorcycle's clutch. This clutch cover is fitted over the existing clutch on the right hand side of your motorcycle. All covers come supplied with replacement bolts for your clutch cover. There is no need to remove stock casings or gasket seals. The timing crank cover is located on the right hand side of your motorcycle. The timing cover is usually the smallest of the set. Once again, all covers come supplied with replacement bolts. We highly recommend using the timing cover with the clutch cover for maximum protection. There is no need to remove stock casings or gasket seals. In some cases the water pump is in a vulnerable location and, when required, are included in complete sets. Engine Cover Sets may include Stator/Generator/Alternator Cover; Clutch Cover; Pulse/Ignition Cover; Water Pump Cover. Protection Bundles may include Bullet Frame Sliders; Paddock Stand Bobbins; Lower Chain Guard. Established as the market leader in Motorcycle Protection Products and second to none! If it doesn’t have the GB logo beware of copies! With nearly 100 years of engineering experience and expertise, GB Racing has gained the prestigious Federation of International Motorcyclists (FIM) accreditation and is now an FIM approved product range worldwide. GB Racing is now considered the benchmark for motorcycle protection products. From Moto GP, World Superbike to Moto America and at your local track day, GB Racing is unequalled. All facets of design using the latest the 3D CAD software and manufacturing including mold making are performed in house and allow GB to rapidly develop, improve and enhance its product portfolio. GB Racing’s core product range is Secondary Engine Covers enhancing bike appearance, at the same time adding additional protection to engine casings. In addition GB offers Frame Sliders/Crash Mushrooms, Paddock Stand Bobbins and Lower Chain Guards.